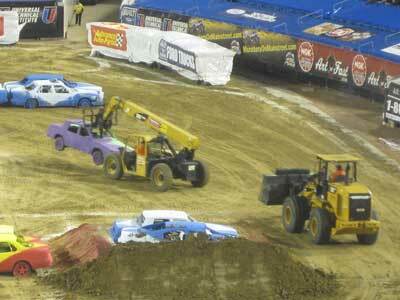 Ring Power Helps Make Monster Jam a Smash! In three different cities, on four different nights, Ring Power supplied all the CATâ equipment necessary to build and stage a monster truck show. 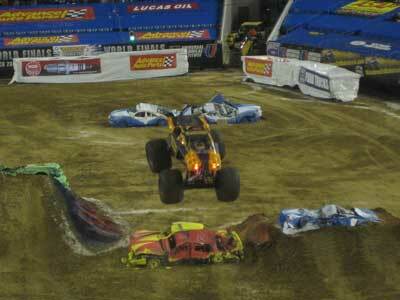 The Monster Jam’s Florida leg started in Tampa at Raymond James Stadium on January 23. Monster Jam had an encore performance in Tampa on February 6th after having an interim show at Orlando’s Citrus Bowl on January 30. The Florida tour de force ended with a completely sold out show in Jacksonville on February 27. So exactly how did Ring Power come to sponsor these events? It all started with a phone call from Feldâ Motorsports’ director of operations for track construction, Dan Allen, to the Sales Coordinator for The CAT Rental Storeâ in Tampa J.D. Fagan. Dan explained to J.D. that his company had been using Neff Rentals of Florida for the last ten years. The last year Dan Allen did business with Neff he was extremely disappointed with the quality of equipment he received. Poor quality equipment creates a time crunch for Feld. 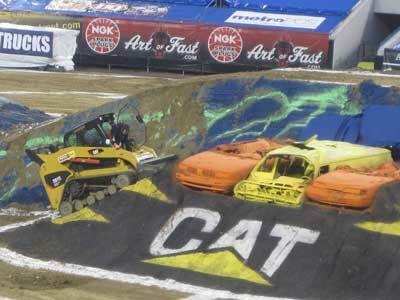 The more equipment breaks down, the less time they have to create the monster truck course. He knew he was guaranteed the very best quality equipment if he rented from the local CAT dealer. So he called us. All these pieces of equipment were used to transport dirt from an off site dirt pit. CAT excavators and loaders dumped dirt into over the road dump trucks that then drove the 35,000 yards of dirt required to build the monster truck course to the stadium. Once inside the stadium, bulldozers and multi terrain loaders shaped and moved the thousands of yards of dirt to create the course. The Feld employees enjoy the track building process almost as much as the Monster Jam show itself. Steve Carmack, the Event Supervisor, explained, "I can’t believe this is my job! This is what we do: (waves arm across entire stadium floor of dirt and equipment) Kids playing with heavy equipment in the dirt. Who didn’t play with a Tonka truck in a sandbox as a kid? At Feld, we’ve just never grown up. Bigger sandbox, bigger toys. As operators, we definitely prefer CAT machines. They’re quicker, smoother, easier to run, hugely efficient. If we ever have the opportunity to use CAT, we do!" The use of CAT equipment doesn’t end with the completion of the track, it continues throughout the show. Any time a monster truck flips or a car needs to be moved, CAT telehandlers are right on hand to effortlessly correct the upturned vehicle. In Jacksonville, Feld used a 930 loader without a bucket to tow broken down trucks off the track. In exchange for the equipment, Feld gave Ring Power tickets to each show. In addition to so many of our employees and customers attending in the show for free, Feld used the Ring Power logo on the jumbotrons and LED banners. Feld also displayed some of the smaller pieces of equipment at the Pit Parties that took place before the rally. Feld read public announcements about Ring Power over the loud speakers and displayed our banners around the ground level of the stadium. In Jacksonville, they even custom painted the CAT logo on the main dirt mound! The Monster Jam truck shows turned out to be a huge success at every one of their Florida stops. Feld was extremely pleased with the quality of the equipment across the state and the eagerness to help displayed by all Ring Power employees, especially Will Courtney and J.D. Fagan. Feld will again use Ring Power for their Motocross tour in March and any future Monster Jam shows. Kudos to CAT Rental guys Will and J.D. !